Put an end to the World-Eater. Alduin calls a rain of fire. Meet with the heroes of Sovngarde. Coordinate your shouts to clear Alduin's mist. Defeat the World-Eater in combat. Leave the Hall of Valor and cross the Whalebone Bridge to the edge of the Shadowed Vale, where your Nord brethren are gathered. They are as eager to slay Alduin as you are. When the three heroes have assembled you will take your place by their sides. Once you have done so, one of them will suggest that you all use the Clear Skies Shout together to blow away the mist. Your companions will wait for you to Shout then use their Thu'um as well. You need to do this three times when requested, as Alduin recovers the field in mist the first two times you clear it away. After your third Shout, the mist dissipates, Alduin becomes enraged and flies towards you and the final battle is joined. This is when you begin your last fight with Alduin. Alduin launches a barrage of fire attacks at you, the Nords, and any lost souls that have been freed from their permanent fog. Alduin's rain of fire ability hits a large area of effect so have wards, healing spells and/or potions ready. To defeat Alduin, you must once again strike him with Dragonrend to force him to land. Until you do, he is invincible and will take no damage. While on the ground, it is relatively easy to kill him due to the fact that the three Nord heroes will help in the battle. Alduin is basically the same as every other dragon the Dragonborn has thus far encountered: melee from the sides to avoid the potent tail attack, have a shield handy if you're planning to go head-to-head. For archers, Alduin is just as susceptible to potent poisons as other living creatures. Hit from a distance with high-damage lingering poisons and he will stay down fairly quickly. For magic users, the Marked for Death Shout is very useful as it increases his susceptibility to damage from spells. Don't stand in front of him, as his fire breath is deadly even to high level players. Resist Fire and Resist Magic may help against this. After you strike the killing blow, Alduin writhes in agony and his soul begins to vanish. Alduin thrashes on the ground as his soul leaves his corporeal form. As his essence drains away, a black tar-like skeleton is revealed underneath. 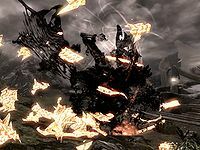 His form continues to corrode, fading into wisps and with a final, thunderous spasm, Alduin is torn apart; not even his skeleton remains in this afterlife. As the mist of Alduin's soul snare dissipates and the sky clears, Tsun congratulates you on your mighty deed, as do your three helpers and all the characters lost in the mist, who will make their way to the bridge. Before leaving Sovngarde, Tsun teaches you the Call of Valor shout which allows you to summon a hero from Sovngarde to fight by your side. You will not be able to reenter the Hall of Valor, so when you are ready to leave, talk to Tsun and he will Shout you back to Tamriel. You will be returned to the Throat of the World. Several dragons are perched there, all acknowledging the Dovahkiin and the destruction of Alduin World-Eater, and one by one they depart. If you did not already kill Paarthurnax, he will have a final conversation with you, and expresses hope to convince other dragons to join the Way of the Voice. Afterwards, if you are still on the mountaintop, Odahviing will come to admit his allegiance to you so that you may freely use his Thu'um to call him, though he warns that not all dragons are willing to follow Paarthurnax's example. Returning to High Hrothgar or Sky Haven Temple will yield further closing dialogue with Arngeir or Esbern respectively. This is easy to miss because the game relies on you to think of returning to the "wise old man". Congratulations! You have completed Skyrim's Main Quest, and may now continue your adventures. Dragons: Dovahkiin los ok dovahkriid. 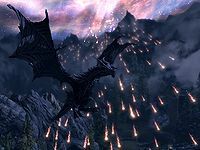 Unlike the Oblivion Gates in the previous installment, the dragons will continue to appear frequently in Skyrim after defeating Alduin. This enables you to obtain more dragon souls for any remaining Words of Power not yet unlocked, as well as obtain materials for creating dragon equipment. After leaving the Hall of Valor, you are unable to reenter. It is impossible to loot Alduin, even though the option presents itself while his body dissipates, however it is possible to harvest dragon heartscales from him. Alduin's soul is not absorbed. You can later discuss the ramifications of this with Arngeir unless you have antagonized him by killing Paarthurnax. 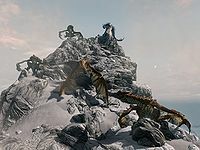 After speaking to Tsun and returning to the Throat of the World, the epilogue scene with Paarthurnax and the other dragons may not trigger correctly, causing only Paarthurnax and Odahviing to be present and preventing any dialogue from occurring. Fast-traveling away from the Throat of the World and then returning may fix this. While shouting clear skies the other heroes might not shout. ? Going into the menu for about 10 seconds may fix this. 10 Gormlaith Golden-Hilt, Hakon One-Eye, and Felldir the Old have come to help me try to defeat Alduin. Together we may be strong enough to dispel the evil mist in which he hides. Once that is gone, he will have no choice but to face us in open battle. 120 Gormlaith Golden-Hilt, Hakon One-Eye, and Felldir the Old have come to help me try to defeat Alduin. Together, we used Clear Skies to dispel the evil mist in which Alduin was hiding. Now he has no choice but to face us in open battle. 200 Finishes quest Gormlaith Golden-Hilt, Hakon One-Eye, and Felldir the Old have come to help me try to defeat Alduin. Together, we used Clear Skies to dispel the evil mist in which Alduin was hiding. We fought and defeated him. Sovngarde and Skyrim are now free from the fear of his return. I have fulfilled my destiny as Dragonborn. The following empty quest stages were omitted from the table: 0, 1, 5, 12, 15, 20, 30, 60, 80, 140, 190, 210, 220, 250, 260, 300. On the PC, it is possible to use the console to advance through the quest by entering setstage MQ305 stage, where stage is the number of the stage you wish to complete. It is not possible to un-complete (i.e. go back) quest stages, but it is possible to clear all stages of the quest using resetquest MQ305. This page was last modified on 3 September 2018, at 12:37.